Command design pattern takes an operation and its arguments and wraps them up in an object to be executed, logged, etc. In the example below, Command is an operation, its argument is a Computer, and they are wrapped in Switch. 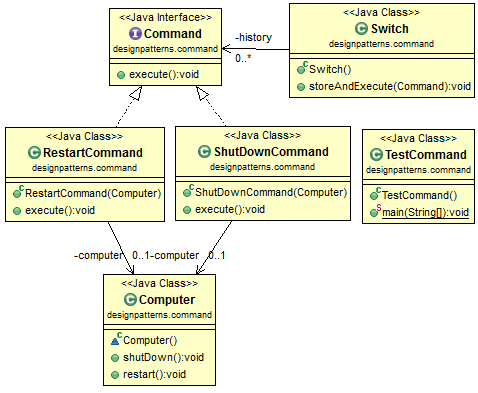 In another perspective, Command pattern has 4 parts: command, receiver, invoker and client. In this example, Switch is the invoker, and Computer is the receiver. A concrete Command has a receiver object and invoke the receiver's method. Invoker can use different concrete command. The client determines which command to use for the receiver. this.history.add(command); // optional, can do the execute only! What-a-whatawhat-what the f* are you talking about? There was no need for the client to see the Invoker. It should be calling the Interface – that’s what the client should be seeing. Small correction: the comparison of str should be “contains” instead of “==”. Because switch is the invoker;and you already studying switch statement in ITCP …………. Hi, this is an excellent contribution. I want to know something, i saw in too much diagrams of this pattern that the client don’t see the invoker, so why in the code, the client can see the invoker?